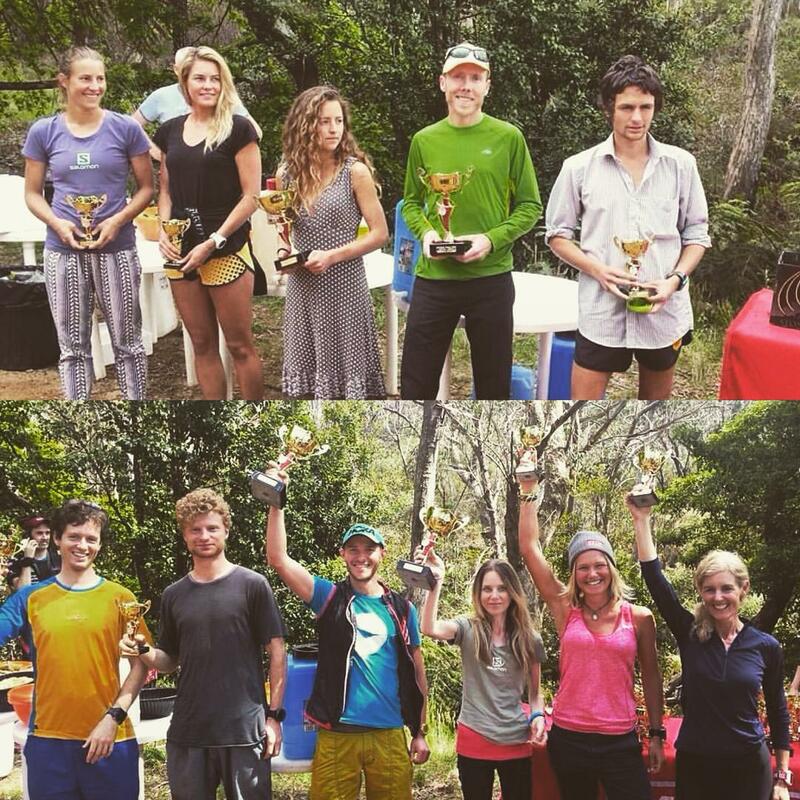 After a couple of months of cycling/yoga to recover from the Euro mountains, I was stoked to hit up another Aus/NZ skyrunning race with Mountain Sports, exploring the cliffs of the Grose Valley in the Blue Mountains. I felt mentally rested and ready to test my body some more. I figured the ultra course should suit me as there is a lot of technical downhill, and all the climbs are definitely hiking territory (none of this douche grade uphill running BS!). I debuted my La Sportiva Mutants as they seem like a good all rounder for longer races – big lugs for mud, sticky rubber for wet rock, plus a bit of a rock plate and heel cushioning to make life easier for tender achilles tendons later in the race! 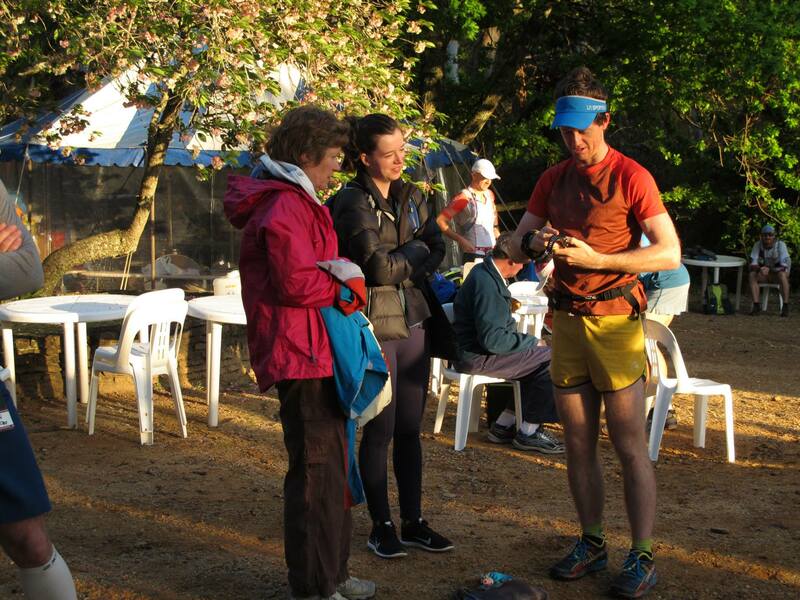 Briefing my awesome crew (Mum+Georgie) for some speedy transitions. Picked up a few mins with efficient handovers. Lately I’ve been trying to break my races in quarters to assist my own mental state (maybe because I grew up in AFL territory on the border of Victoria) so let’s go with that for the race recap. Conveniently, the Hounslow course has 4 major pairs of descents and climbs. 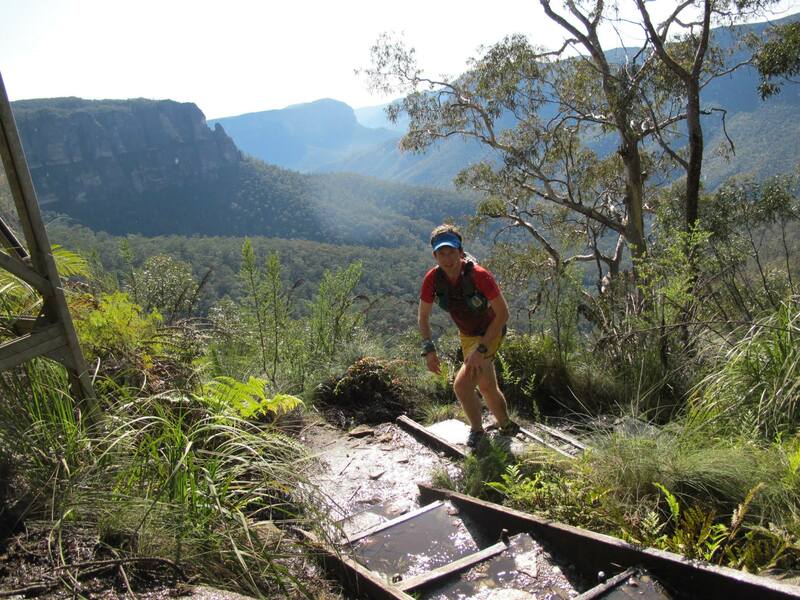 You start at the top of the cliffs in Blackheath then dip in and out of the Grose Valley 4 times! The course also kinda looks like a lollipop – the first quarter circles the lolly bit, the second quarter runs down the stick, third quarter back up the stick, then final quarter does the lolly loop backwards! It sounds like so much fun when you talk about lollies instead of hiking up and down cliffs! It’s always tempting to flog it at the start – you feel great and there are lots of fast people around to chase/chat with. People try to take advantage of the easy running without pushing too hard – which can be a difficult threshold to pick! I figure if you can chat and laugh with your fellow runners about their latest adventures then that’s a solid indicator of excellent pacing. I sat in a pack of about 6 guys and we all let Ewan find the track markers (thanks mate!) down to Junction Rock at the bottom of the Grose Valley. On the climb people started to spread out and switch it up a bit. Ben Duffus, Eric Holt and Ian Gallagher were way off the front already. 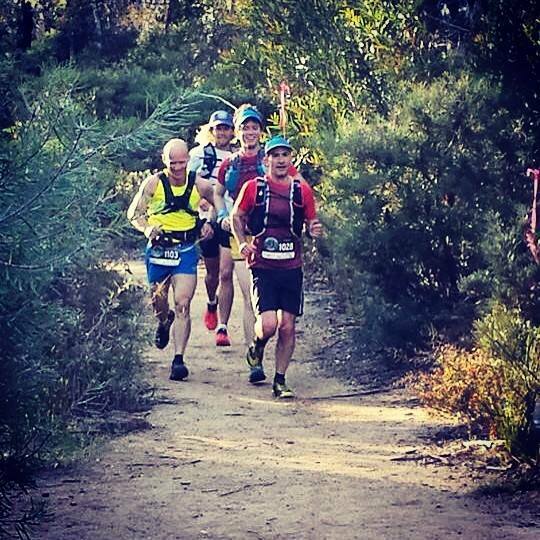 In my little pack, Andy Lee shot off ahead and I climbed up with Marty Lukes as we reminisced about how he crushed the final 20km at Buffalo Stampede earlier this year! Just trying to find a cruisy pace, which is easy to do when the course is all flowy single track around the top of the cliffs. I got a bit too flow-ey and missed one of the turnoffs! I ran backwards to correct my mistake, then bumped into Marty Lukes, so we figured we must be on the right course. After a few km we popped out on to a road with no markers, which was a bit concerning. At this point we just headed towards the next point where we could meet up with the actual course and bumped into Ian Gallagher. He had previously been ahead of us, so we raced backwards (at race pace!) along the course until we hit Andy Lee, who had been just behind us at the last checkpoint. It made sense at the time and hopefully this evened out the alternate route that we took! 4th-6th with Andy Lee and Marty Lukes heading into Perry’s at the start of the 2nd quarter! The biggest descent of the day was down from Perry’s in to the valley again. I made a small gap away from Andy and Marty, then began to faulter in the heat on the climb out the other side to Lockley’s Pylon. Andy caught me just as we started to hear some doof doof music, which seemed strange! A few more switchbacks and the source was revealed as Clarke McClymont, darting around the course with speakers in tow blaring ACDC! After this boost, I jumped on the Andy train and we got to work mowing down Ian Gallagher just as we crested Lockley’s. Not long after this we saw Ben Duffus motoring back the other way, having already hit the turnaround point and continuing to tear it up. 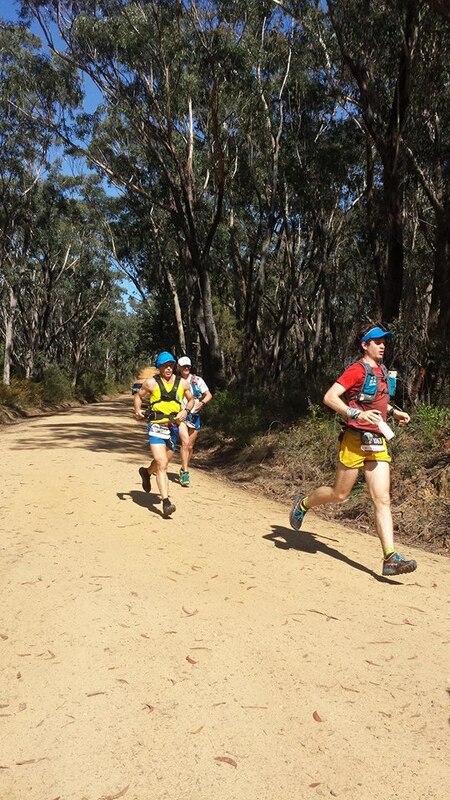 Eric Holt was sort of halfway between us and Ben – far enough ahead not to worry about him for the time being, and a bit of a reality check for the rest of us as he was racing his first ultramarathon! Climbing up to Lockley’s Pylon w/Andy Lee towards the end of the 2nd quarter. Clarke provided the booming ACDC beats. Ian, Andy and I all hit the Pinnacles carpark (halfway turnaround) pretty much together. We all softened and stopped to pour some water over our heads and smash some ice cold ginger beer/coke/powerade (thanks Scott Hawker and other aid station volunteers!). As we headed back out, it was really fun (and strategically interesting) to see how far back the chasers were and what condition they were in. Beth Cardelli was smashing the girls’ race but it looked like a tight battle for 2nd between Maggie Jones and Lucy Bartholomew. The heat and humidity was really starting to take its toll as we dropped back into the valley for the 3rd time. The other racers were all super friendly and cheered us on while stepping off to let us pass on the narrow track with two way traffic, even providing estimated splits ahead to Eric and Ben. Suddenly a big group of runners appeared in the middle of the track, and it became apparent that one of them had been knocked down with heat stroke! I couldn’t actually see the person, but they had 4 people around them so Ian and I promised to give the next radio checkpoint a heads up, and continued on our way. At the bottom I allowed myself 10 seconds of bowing down face first into the river to help cool down (just like heart melting pose from yoga!). It was really tempting to stay longer, and I’m pretty sure Ian went for a full dip while I got a head start on the 3rd climb, back up to Perry’s. The heat was pretty brutal and I was struggling, stopping to sit down, lower my heart rate, and rub my red face on some cold wet rocks. Ian blew past me, then Andy reappeared and we climbed together again. Deja vu, again we hit the ACDC beats and Clarkey with his camera out! That view made all the stairs worthwhile! Q4 – race starts now! I climbed back into Perry’s together with Andy Lee, and we could see Ian setting off as we arrived… game on! At this point it started to rain, which seemed to wash any cramping and overheating problems away. I actually felt pretty great at this point, and talked some smack with Matt Adams as he cruised along the fire trail beside me on his cyclocross beast. I pulled away from Andy on the single track around the clifftops, caught Ian before the final checkpoint and managed to sneak out of the checkpoint before he got in, which I figured would be a mental blow if he was considering chasing. From this point I didn’t look back – felt strong and maintained a solid pace down to the river then hiking up the grand canyon without any incidents. The final few km seemed a lot hillier than it did at the start of the race, and I recruited a few trail kids to yell really loudly if a runner came up behind me, as I had no idea where Ian was. 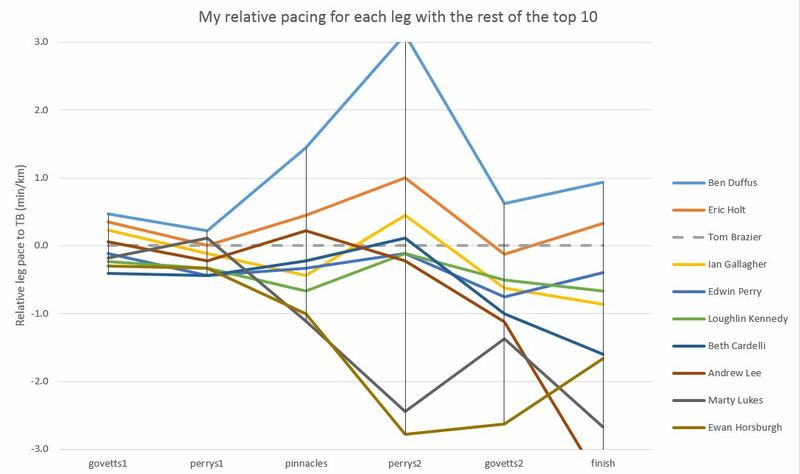 Eric, Ian, Edwin, Loughlin, Beth all have pretty similar profiles, indicating their relative pacing between each of their own legs was similar. Their spike at Perry’s 2 and dip at Govett’s 2 relative to me tells me that I sucked on the 3rd climb but did pretty well around Pulpit Rock on the way home. Massive congrats to Ben, Eric, Beth, Lucy, Maggie and all the runners out there who gave this monster course a crack! We all seemed to be walking and talking reasonably well at the finish, presumably thanks to the technical nature of the course – forcing us to control the pace and spare our bodies from redlining the entire way. 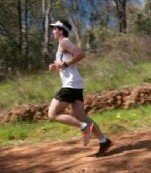 On Sunday it was exciting to see the cracking pace of the 23km. 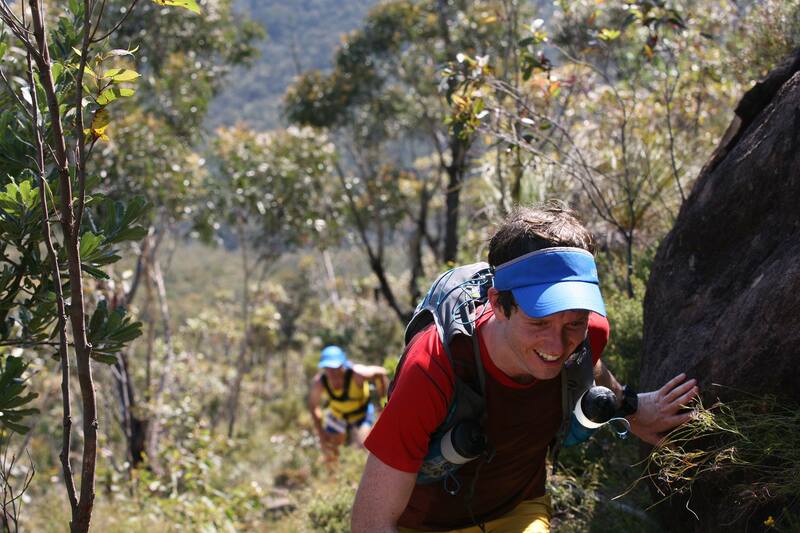 I’m sure the descents were much sketchier at 23km race pace than in ultra mode. Massive props to La Sportiva teammate Aaron Knight for coming out on top after playing it cool on the descent, watching his foes launch off into the distance, then backing himself and climbing to victory on the way out. Can’t wait to see this guy in action at Bright 4 Peaks in a few weeks time! Podiums for the 23km and 68km – Knighty reckons we need to learn some podium etiquette from cycling and put the winners in the middle! Here’s a little video from the finish courtesy of Sean’s team. I think we were all a bit mentally shagged by this point!